Utilising stainless steel wire under tension between stainless steel stand-off's this system allows for large scale trellis installations. 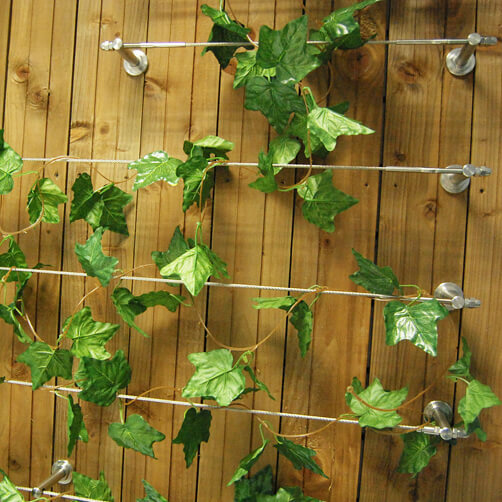 Our simple system allows for ambitious and creative wire trellis applications. We have designed our system to be versatile, easy to use and extremely affordable. 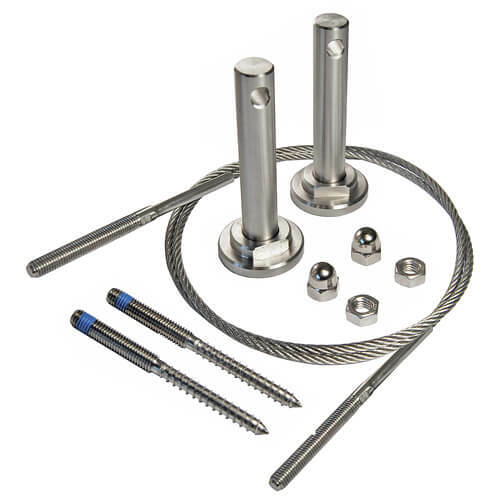 Made from 316 Marine Grade Stainless Steel in the UK, our tensioned plant training system will allow for high strength, high load applications. 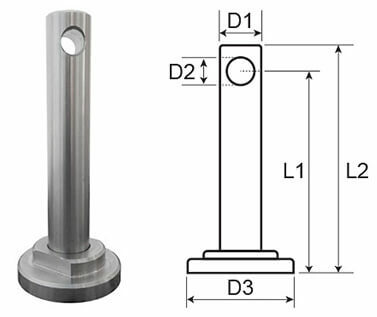 To specify the required length of the cable assembly simply give us the length required between the 2 fixing points. Each cable can span up to 20 metres and still achieve good tension. The system can be mounted either vertically or horizontally. Download and print our installation advice sheet for the made to measure Tensioned Wire trellis system. Plan your project in advance to ensure you have the correct number of mounting hubs, wires and fittings. You will need a few simple houshold tools for a quick and easy installation: Chalk/Pen, Drill, Hex Head Key, Wrench and Spanner. 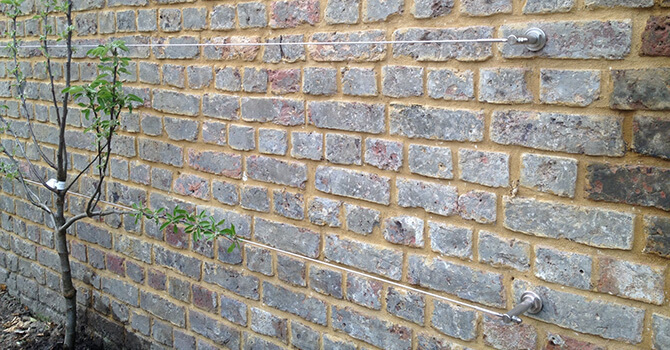 It is a good idea to layout your design onto the relevant surface with a pen or chalk prior to drilling any pilot holes, taking factors such as brick spacing into consideration. Ensure you leave no more than 30mm of thread protruding from the mounting surface for a perfect fit. A: Timber Mount Screw in the dual thread screw into place using the hex head key. B: Masonry Mount Insert rawl plug first and then screw in the dual thread screw into place using the hex head key. Screw the surface mounting hubs onto the dual thread screws, aligning the centre holes with each other. B: Perfect alignment of the cross holes can be achieved by simply turning the adjustable base plate of your hub in or out. Place the threaded end studs into position through the hub fixing holes. Starting at one end, attach a M8 nut.Remember to leave only a small amount of thread showing, so that when you tension the wire, more thread will be revealed to provide thread for the dome end nut. Once in place attach the remaining M8 nut to the opposite end.Ensure both ends are finger tight with an even amount of thread showing. When applying tension it is important that you do not allow the wire rope twist. We recommend using a 6mm spanner or a set of grips on the spanner flat of the threaded end assembly to hold the wire in place. Use a 13mm spanner to tighten the M8 nuts evenly in slight increments until you have the required tension. Ensure you leave the same amount of thread protruding at each end. 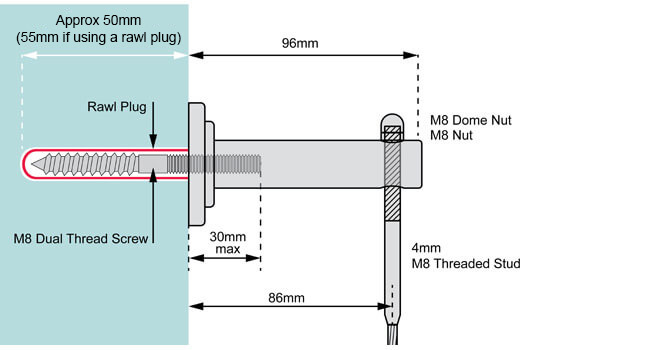 Once you have tensioned the wire rope, simply attach and tighten a M8 dome nut against the M8 nut at each end. 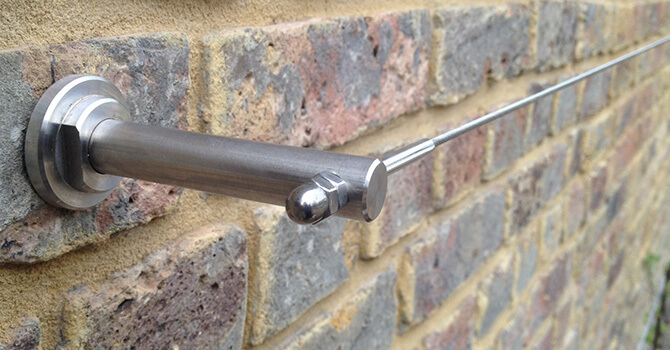 This will provide a safe and stylish finish to your tensioned wire trellis system. 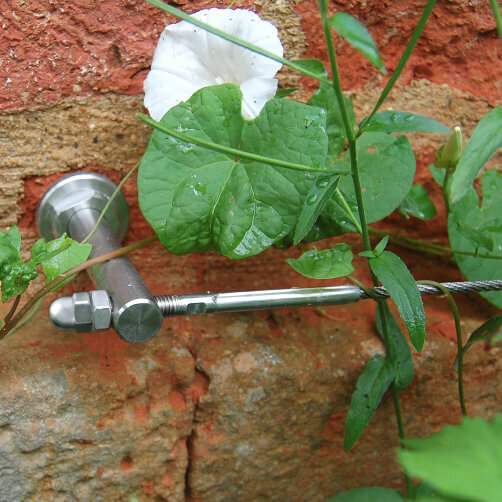 You can add vertical wires to horizontal tensioned wire trellis (see pic above) by using stainless steel wire cross clamps to hold the vertical wire in place. 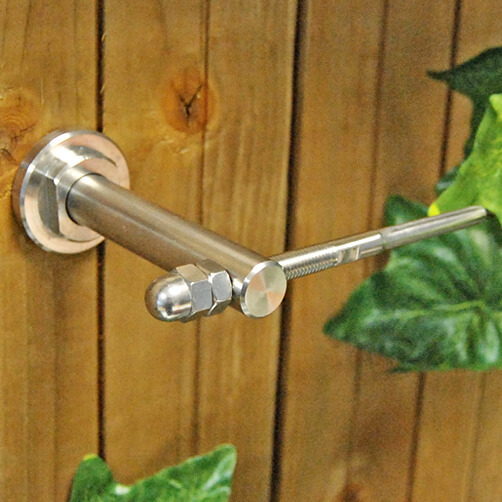 Very classy looking product well made and easy to install but expensive! Top quality materials. Compared to a previous design of this item purchased about 9 years ago, the wires might not be able to be quite so tightly tensioned, as the retaining pins fixed into the wall are thinner and depend on the close fitting collar to avoid the pins being deformed. However provided you are careful to take this into consideration, the installation should be very serviceable. Brilliant quality. Simple and straightforward to install. Incredibly strong. And they look wonderfully smart. Too quality materials and excellent customer service. Instructions could be enhanced but pretty good. Made-to- measure is the way to go. High quality product. Easy to fit. Well made & good looking. Excellent product, easy to install. Looks good and is effective to espalier my fig trees.